Spice up your workout routine by adding some full-body moves and reap entire rewards from your strength training program. Realize significant progress every week from your strength workout with these full-body movements. Having a solid foundation is key in breaking through your plateaus and diving into strength workouts. Thus, if you’re a novice or it’s been long since you lifted weights it’s essential to ease into a regular weight-lifting program. You can kick-start your program using machine-based weight lifting to help you build your confidence. The use of machines will not only allow you to focus on form but also add weight gradually, as well as accustom yourself to moving not just your body weight. After some time, you can then take your training program to the next level by including free weight type workouts. To increase the effectiveness of training you can also consider supplements. Maximize your strength training sessions with upper body movements. These type of movements fall into two main categories the vertical and horizontal. Vertical pulling workouts usually involve moving a weight down straight up relative to your torso. Great examples of such exercises include pull-ups, lat pull-downs and chin-ups. Horizontal pulling exercises are workouts that entail moving a weight in towards your torso horizontally from straight out in front of you. Some of the most common examples of horizontal pulling movements include dumbbell row, bent over rows, T-Bar Rows, and seated cable rows. Tightly hold on the bar with your palms facing your body. Maintain a standing position with the bar tightly held using a double overhand grip. Lean forward until your upper body is almost parallel to the ground. Then start the movement by moving the elbows behind your body whereas pulling back the shoulder blades. Then slowly lower the bar to the initial position. Your upper body can push both vertically and horizontally. Overhead pressing exercises are some of the best examples of vertical pushing movements that you can do at home or in the gym. Horizontal pushing consist exercises such as push-ups (check this 10 level guide to push-up mastery) and bench pressing. You can effectively do a pushing exercise by pushing some weight away from your torso or pushing your body weight away from the ground, similar to a push-up. Begin by putting your hands directly below your shoulders and positioning your body horizontally, resting on your hand and toes. You then need to move downwards by squeezing your upper back until your chest touches the ground. Once in the down position, move back up by pushing through your hands, keeping your chest out and going up. At the peak of the movement, your shoulder blades can protract or separate. Make sure that your elbows and upper arms are at a 45-degree angle to your body during the entire movement. Repeat the same until you complete the set reps.
Rest on a bench with back support in a squat rack. Place a barbell at an accessible point above your head. Tightly hold onto the barbell with your palms facing forward. Once you have the right grip, slowly lift the bar up by locking your arms. Maintain at near shoulder level and a little in front of your head. Now this will be your starting position. Bring the bar down to the shoulders carefully and slowly as you inhale. Take it up once more to the starting position while you exhale. Continue doing this for the set amount of reps. Maintain your upper body upright, with your shoulders backward and relaxed and chin up. Concentrate on a point in front of you to keep you from looking down. Step forward using one leg while slowly lowering your hips until you reach an angle of 90 degrees both knees bent. Ensure your front knee is right over your ankle, and also your other knee doesn’t come into contact with the floor. Maintain the weight in your heels while you push back up to the initial position. Lift the weight slowly using your posterior chain and legs. These types of workouts demand movement around the knee joint. Doing these exercises usually strengthens the anterior of the upper leg, the quadriceps muscle group. Squats and step-ups are some of the exercises considered knee dominant. A squat is a movement exercise where you establish both feet on the ground, then slowly bend your legs to bring your body down whereas maintaining your chest up and lower back straight. You can use a barbell to get resistance to a squat from the front of your body, on your back with a barbell. You can also create resistance from the sides using dumbbells, or even on the whole upper body by putting on a weighted vest. Each of these resistance methods requires the lower back and abs to contract to maintain your body upright as you are moving down. The main challenge to proper squatting is usually due to tight hip flexors or tight calves. When looking to maximize the benefits of a strength workout, consider incorporating full-body movements into your routine. 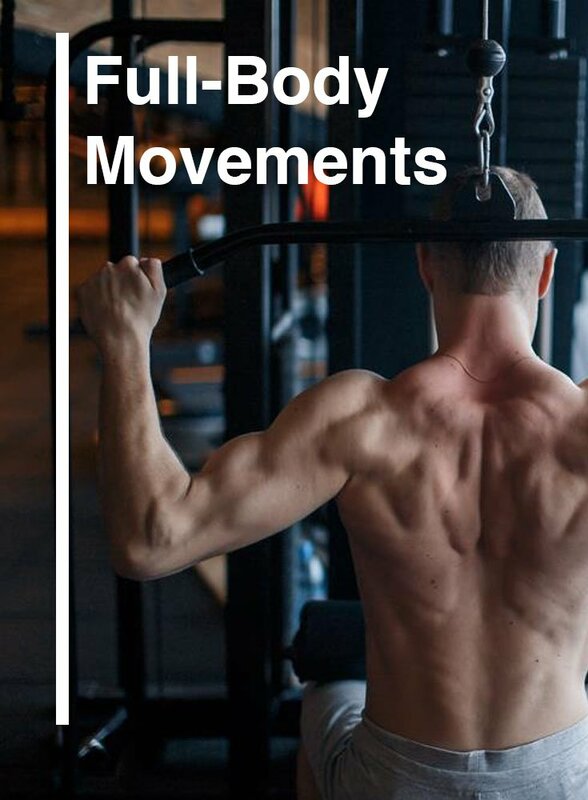 You should combine lower and upper body movements if you’re looking to burn huge numbers of calories and cut down the amount of time you’re strength training. You should always remember to maintain proper coordination of these types of exercises to reap maximum benefits. Seek the assistance of a fitness professional whenever you feel anxious, so that you may be guided and make sure you stay safe while performing these movements. Full-body workouts can all work for building muscle and strength. If you’re a novice, full-body exercises can work for you mainly because they are pretty easy to understand, don’t demand much of your time. Author Bio: I’m Tina Howell, chief editor at XBodyNow. I have an in-depth knowledge about gym, fitness, bodybuilding… which are shared with you through my site. My mission is to make you aware about the right exercises, workout plans and nutrition.